Satis Bistro in Jersey City, writes Pat Tanner in her review, combines the most beloved dishes of French bistros, Italian trattorias, Spanish tapas joints and Portuguese cafes. That’s a lot to juggle, but by adding a modern twist, Tanner says, Satis succeeds more often than not. Cherry-pick the most beloved dishes of French bistros, Italian trattorias, Spanish tapas joints and Portuguese cafes, give them a slight modern twist, and you have Satis, the pan-European bistro in Jersey City’s Paulus Hook neighborhood. Bouillabaisse? Oui, monsieur. Gnocchi? Si, signora. Patatas bravas? Si, señor. Kale, potato and linguica soup? Sim, senhora. The linguica in that Portuguese soup, which also contains chorizo, is one of about a dozen first-rate cured meats on offer, some made in house by Chef Michael Fiorianti, others from Salumeria Biellese in Hackensack. Platters of interesting salumi like wild boar cacciatorini and culatello (prosciutto’s highbrow cousin), as well as equally well-chosen cheeses, are significant draws here. Fiorianti ran the kitchen at Goldman Sachs in Jersey City when he was with Restaurant Associates and also once interned with Thomas Keller. 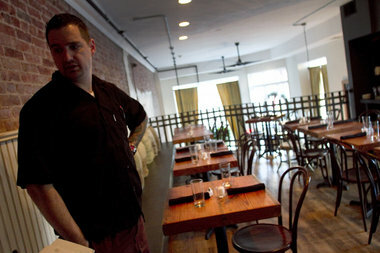 The chef is one reason this 68-seat bistro quickly became a neighborhood hot spot, especially for hip young professionals, soon after opening in December 2010. The aforementioned gnocchi are made in house of ricotta, not potatoes. Rather than the usual nubbins, they’re fat, fluffy pillows. At Satis, they’re tossed with a tumble of white beans, braised escarole and mellow garlic confit so full of good, earthy flavors that the dish has become Fiorianti’s signature. My companion who ordered it was still talking about it weeks later. When a beef-loving companion ordered the cauliflower steak, I thought he had misread the menu. Instead he wound up hoarding it, and I can’t fault him. The thick white slab is the size and shape of a big steak and treated as such: seared until caramelized, then paired with house-made steak sauce amped up with pine nuts and raisins. Peppery arugula and half-size roasted tomatoes filled with fregola (a couscous-like pasta) are the apt accompaniments to this hearty, satisfying vegetarian dish. The setting also takes cues from casual European eateries, albeit with a big splash of downtown cool. A wall of vintage brick soars to the open second-floor dining room of a handsome building that dates to the early 1900s. It was vacant for three years before being purchased by Satis owners Michael Garcia and Geza Gulas, whose first project was Lucky 7 Tavern in Jersey City. Towering bay windows sport tangles of flowing greenery flanked by drapery. At night, the worn, dark-wood floor and tables gleam in the faint glow of vintage chandeliers and table votives in both the main and mezzanine spaces (where it can get really noisy). In the rear of the main space is the brightly lit salumeria, walls lined with white subway tiles and decorated with hanging sausages, salami and cured hams. In good weather, there’s seating on the bluestone terrace. Gulas acts as host and sometime server. He is quirky, so you’ll either be charmed or turned off by his idiosyncrasies. He often appears put-upon and once tried to win our sympathy by complaining about a negative comment he had received on Yelp. The service team is generally efficient, although on one occasion attention flagged for seriously long periods after we received our entrées. And a caveat to groups: 22 percent gratuity is added to parties of six or more. In true European style, you can make a meal of the appetizer, salumi and adventurous cheese plates. My favorite starters include the albondigas: three tender, golf-ball-size spheres of ground lamb and pine nuts bathed in just-spicy-enough tomato-saffron cream sauce. Almost as compelling is Fiorianti’s duck-liver mousse—unctuous, deeply flavorful, multiplied by a slab of toasted brioche smeared with whipped duck fat. Satis has its share of middling dishes. House-made gravlax is very good but was taken down by Kalamata olives and baby potatoes that were both too salty. The so-called daily bruschetta was white-bean hummus on each visit, a bit boring. Braised short ribs fell short on flavor, moistness and tenderness. The goat-cheese mashed potatoes they nest upon almost made up for the ribs, but why bother when you can order a side of mashed potatoes with goat cheese and chorizo? I guarantee your table will be fighting over these. Osso bucco with roasted-chestnut polenta is delicious, but does it warrant a $34 tab? With only eight entrées (seven on nights when the bouillabaisse is not offered), Satis needs to make sure every single one is worth ordering. The biggest disappointment is that very bouillabaisse, which one night featured grouper and tiny clams—both nearly tasteless—and watery, wan broth. Gelato is a strength here. The menu also features three deep-bowled gelato sundaes—like German chocolate cake, made with coconut-almond chip and dark-chocolate gelati, candied pecans, toasted coconut and butterscotch sauce. Word to the wise: Share. We enjoyed the sundaes more than, for example, a banana tart tatin with tough pastry. My favorite ending to a meal at this cool homage to European bistros is affogado, simply a shot of hot espresso poured over vanilla gelato. When the real estate bubble seemed about to burst several years ago, Michael Garcia knew it was time to make an investment — and career — move. Tell that to restaurant owners forced to close up shop in recent years. But Garcia and partner Geza Gulas seem to have found a niche with Satis, a bistro/cafe in Jersey City’s Paulus Hook neighborhood. The two are no strangers to JC; they also own Lucky 7 Tavern. It’s a handsome space with hardwood floors, brick walls, seriously high ceilings and abundant light. An earthy, meaty Old World aroma wafts from the salumeria, where you can get jamón serrano (Spanish cured ham); speck (dry-cured smoke ham) and finocchiono salume (Tuscan-style cured meat seasoned with fennel). Prices may seem high, but you know the old saying: you get what you pay for. Take the Satis burger ($11), eight ounces of Angus beef, perfectly cooked, with shallot marmalade, Boston lettuce and roasted garlic aioli. What does it have over that $6 burger at your neighborhood sports bar? You mean, besides better taste? The braised short rib with chorizo and goat cheese mashed potatoes ($20) features terrifically tender meat and a perky sauce you’ll want to dip bread, or a spoon, or your fingers into. The housemade ricotta gnocchi with escarole, white beans and roasted garlic ($18) bear no resemblance to any gnocchi I know — they’re more like square ravioli — but the creamy sauce makes for a pleasing pasta. The grilled spicy lamb merguez sausage, with saffron rice, tzatziki, sweet tomato and red onion chutney on a grilled pita ($17) is less successful; the lamb is on the greasy side. And the salad with Boston lettuce wedge, shredded pork belly and apple and celery root slaw ($14) is drenched in a too-tame house-made gorgonzola buttermilk dressing. Other entrees include mariscada (grilled lobster tail, mussels, clams, calamari and rock shrimp stewed in white wine, garlic and tomato broth, $34); filet mignon (sherry-glazed 10-ounce Angus filet with celery root, creamed spinach and crispy shallots, $29); and farmer’s market paella (saffron bomba rice, local farmer’s market vegetables, sweet baby tomato and Castelvetrano olives, $22). The sandwiches — all with high-end ingredients and a swirl of seasonings, spices and dressings — are uniformly excellent. The house-roasted all-natural turkey breast comes with brie and a sweet little apricot mustard ($8). The Tuscan BLT with crisp pancetta, arugula, heirloom tomato, roasted garlic aioli and potato onion levain ($7.50). I found myself picking off the pancetta — Italian bacon — one by one. Then I remembered my promise to bring food back to the office. Whereupon I picked off some more. Other super sandwiches: the grilled chicken paillard with piquillo pepper and red wine goat cheese on toasted, tasty, multigrain bread ($7.50) and the grilled beef tenderloin with crispy shallots, horseradish mayonnaise and watercress ($9). Dessert? De-lish. The German chocolate cake sundae ($8), with milk chocolate gelato, almond joy gelato, toasted coconut, candied pecans and warm butterscotch sauce almost disappeared on the short ride from Jersey City to Newark. The apricot creamsicle ($8), with apricot sorbet, Madagascar bourbon vanilla gelato, vanilla wafer cookie, whipped cream and mandarin orange coulis, is equally swoon-worthy. Next time back I’ll probably go straight for that German chocolate cake sundae. And eat it there, outdoors, on a warm summer day. No more quick, furtive scoops in the car. Satis, 212 Washington St., Jersey City. 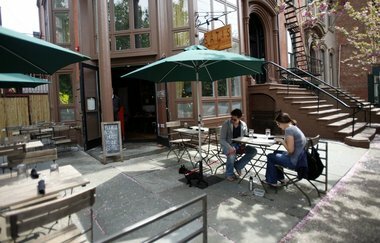 (201) 435-5151, jerseycity.satisbistro.com. Hours: 11:30 a.m. to 3:30 p.m. and 5:30 p.m. to 10 p.m. Tuesday through Friday; 11 a.m. to 4 p.m. (brunch) and 5:30 p.m. to 10 p.m. (dinner) Saturday and Sunday. Closed Monday. BYOB. Take the best types of specialty shops in Italy and France, throw in a restaurant, and you’ve got Sátis. 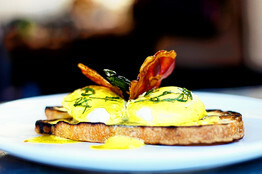 Poached eggs and crispy pancetta at Satis. The new restaurant in Jersey City’s quaint Paulus Hook neighborhood offers crepes, gelato and specialty cheeses and meats, alongside their takes on classic dishes from France, Italy and Spain. The BYOB bistro provides carafes of fresh orange juice ($10) for mimosas; a liquor store is just down the block. Sátis, 212 Washington Street in Jersey City, 201-435-5151, serves brunch on Saturdays and Sundays from 11 a.m. to 4 p.m.
Doug Bauman/The Jersey JournalChef Michael Fiorianti shows off the upstairs dining room at Satis. Any Hudson County foodie will love Satis Bistro, 212 Washington St., Jersey City where Old World flavors and contemporary style collide. Only two weeks into its tenure in Paulus Hook, the restaurant has boasted a full crowd every single night. The seasonal menu combines Italian, French and Spanish flavors and appeals to a palate yearning for something rich and savory within an inviting ambiance. But Satis has set its cap higher than being merely a fine dining experience. Its salumeria offers a fine selection of Balthazar bread, imported meats and cheeses and just next door, the gelateria is the perfect place to stop by for a sweet treat or an upscale coffee break. As the Latin term goes, no visitor will walk away un-satis. PROVENANCE: A kid from Queens, the chef is now a proud resident of Jersey City with an apartment just a block away from his new establishment. Growing up, he loved to stand in the kitchen of his grandmother’s “old-school Italian” restaurant in New York City and watch her work her culinary magic. “My grandmother was a phenomenal cook,” he said. HOW HE BECAME A CHEF: He entered New York City Technical College’s culinary program, before taking the advice of a chef who told him he could learn everything he needed to know by simply getting his hands dirty. Fiorianti has since traveled the country participating in apprenticeships with well-respected culinary masters such as Thomas Keller. After a nine-year stint as executive chef for Goldman Sachs in Jersey City, Satis is Fiorianti’s first restaurant venture. “I’ve never been happier in my life,” he said. HIS SIGNATURE: Fiorianti’s housemade ricotta gnocchi is the dish that keeps ’em coming back for more. “People have described them as little pillows of heaven,” he said. Served up with white beans, escarole and roasted garlic, the celestially delicious entree is warm and comforting and sure to remain a year-round staple on the seasonally designed menu. For more information on Satis Bistro, call (201) 435-5151. The restaurant is open on Mondays from 7 a.m. to 4 p.m., Tuesday through Friday from 7 a.m. to 11 p.m., Saturday from 11 a.m. to 11 p.m. and Sunday from 11 a.m. to 5 p.m. The owners of Lucky 7 Tavern have teamed up to bring a new foodie haven to Paulus Hook. Satis, Latin for “enough” — as in, satisfied — will feature a butcher, a baker and … a gelato maker. The bi-level space at 212 Washington Street was most recently Taste of Cin deli and, long before that, a meat market/grocery called The National. Garcia and Geza Gulas, his business partner, are keeping the history of the building alive through both the industrial chic decor — Edison light bulbs hang low over repurposed rough wood tables fashioned from the floorboards of a house on Montgomery Street — and the food: hocks of jamón serrano and logs of salami hang front and center, ready for deli orders and sandwiches. In addition to a deli, Satis will feature a barista/cafe counter for morning coffee and pastries, a sit-down restaurant for lunch and dinner (and eventually brunch), and an adjoining dessert shop that will serve cupcakes, cake and up to 24 flavors of gelato. The bread is from Balthazar; the pastries, homemade; the coffee, Bristot; and the gelato — well, that’s a secret. “But I can promise you it’s delicious,” says Garcia. The top-secret gelato will be highlighted in sundaes such as The German Chocolate Cake, which features milk chocolate and Almond Joy gelato, topped with toasted coconut, candied pecans and warm butterscotch sauce. “The girls will like them, and the guys… we’re sure they’ll like them, too,” says Garcia. Dessert will be served both in the restaurant and the sweet shop — “like Serendipity,” says Garcia, referencing the New York dessert mecca. In fact, Garcia and Gulas name-drop a few New York restaurants as they talk about Satis, including Citarella. Like the fine-food deli, Satis will sell its prosciutto and other meats and cheeses — as well as imported specialty foods from across Europe — to retail customers. Chef Michael Fiorianti, who has worked in corporate dining for the past nine years and was a consultant for the lauded but now-shuttered Jersey City restaurant Ox, has created a menu with a variety of European influences, including Italian, Spanish and French. “It boils down to a Manhattan dining experience,” he says. Fiorianti’s signature dish will be braised short ribs with chorizo and goat cheese mashed potatoes. Also on the menu are appetizers like bacon-wrapped, marcona almond-stuffed dates, and entrees like jumbo prawns with elephant garlic and saffron aioli potatoes. Though it doesn’t have a liquor license, Satis has worked with a sommelier to create a wine list that will be available for purchase from Liberty Liquors, located just down the street. Diners will be able to order wine from the store and have it delivered to their table. The restaurant will have seating for 68 inside, and up to 55 outdoors. “Outside will be a true European-style cafe,” says Garcia. Opening the restaurant took Garcia and Gulas almost a year. Throughout the process, neighbors frequently stopped in and offered their support. Garcia and Guzas are confident Satis will return that warm welcome when they open its doors on December 9. “In the morning, you’re going to know the guy who makes your coffee, and he’s going to know you and how you like it,” says Garcia. Satis Bistro | 212 Washington St. | Opening December 9 | Lunch: Monday through Friday. Dinner: Tuesday through Saturday. Brunch: Saturday and Sunday after January 1.